Wool growers can now compare Merino bloodlines from wether trials and on-farm comparisons that have been run across Australia over the past ten years. 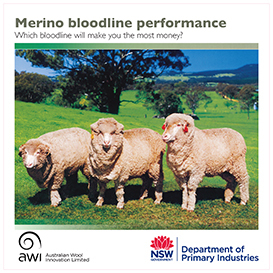 The Merino Bloodline Performance analysis is a joint initiative between NSW Department of Primary industries (NSW DPI) and Australian Wool Innovation Limited (AWI). The analysis takes out all environmental factors between trials and years, leaving only the genetic variation between the bloodlines. Bloodlines are only reported where wethers in a team have been bred from the same ram source for at least five years, and where the accuracy of results is medium or high (based on standard errors of clean fleece weight). The 2018 results demonstrate significant variation in production between the 73 bloodlines, with a range of 3.6 µm in fibre diameter, 28% in clean fleece and 13% in liveweight. These production differences therefore translate into very significant differences in bloodline profitability.